Written by chris maroulakos on Friday, April 24th, 2009 at 6:17pm. If you missed out on Leonard Cohen’s stellar San Diego performance earlier this month, you’re probably not feeling too good about yourself. 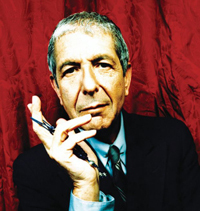 And if you blew your second chance to see Cohen this month—at last weekend’s Coachella festival—you probably feel downright awful. But don’t worry, because—even though you don’t deserve it—you now have yet another chance to experience Mr. Cohen in concert. Well, sort of. For this week only, the nice folks at Pitchfork are streaming Cohen’s Live In London concert film for free. The concert film, included as a DVD companion piece to his recently released live album of the same name, proves that the remarkable Cohen is still at the top of his game. So sit back, turn out the lights, set the video to full-screen mode, and pretend you’re enjoying the unmistakable crooning of the great Leonard Cohen in person. How many more chances do you need?